For the last 15 months or so, I’ve been involved in a spare-time project together with a colleague with the explicit goal of improving programmer understanding of program source code through static program analysis. Static program analysis, as opposed to dynamic program analysis, happens before the program is actually run – and in our case, before the program is compiled to executable code. So what do we hope to achieve through static program analysis? In short we hope to provide a view of a program which presents important facts about the code, provides navigation between source code modules and farther along, tries to prove certain properties about parts of the program – for the sake of correctness and efficiency. The language in question is called C/AL and is a programming language used by the Microsoft Dynamics NAV business software platform. These modules combine to form a powerful software platform for analysing and to some extent transforming program source code. The infrastructure itself is developed using Microsoft F# – a multi-paradigm but functional-first programming language. The first tool we built using this static analysis infrastructure is called Supervision and it is available for anyone interested from our homepage, and from mibuso. Procedure calls are hyper-linked to the relevant procedure declarations and in general all declaration references are hyper-linked to their declarations which have been resolved through name resolution. There are some nice presentational aspects of Supervision too; for example hovering over parameters, all uses of these are high-lighted below – which is a very fast way of gaining an overview; at least for well-factored procedures which do not span multiple pages. 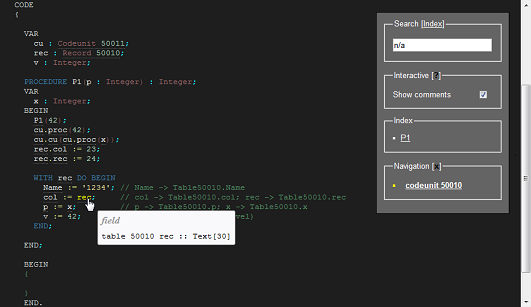 The tooltip also shows the number of usages of parameters. In general there are tooltips for almost everything. The reverse is also true: if hovering over a parameter usage inside a procedure the parameter will also be highlighted. Many more such small details are present. Dispite the limitations of Supervision, we still find it a great tool and there’s not much for the Dynamics NAV ecosystem to rival it. Surely it is non-trivial to build such a tool. Since analysing the user experience of Supervision and looking at more features, we decided to try and build a more sophisticated application with the GUI to match. After a period of consideration we decided to build this application using Windows Presentation Foundation (WPF). This is Microsoft’s strategic UI framework. It has been no walk in the park to make WPF play ball; creating a code viewer requires some virtualization techniques to be used which are non-obvious and requires some research to figure out. Now however, we think we’ve succeeded. With Prism we can now show the user a fully structured view of the tree container structure inherent in Dynamics NAV source code files and we can do so in a visually pleasing and more easily accessible manner – while maintaining our mantra to put the code not just “at your fingertips” but “in your face”. 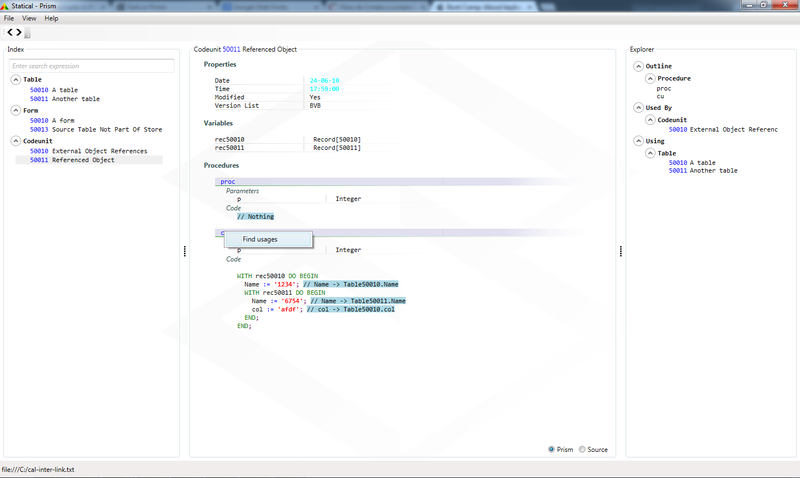 Prism takes about 20 seconds to access, parse and index all objects in a complete Dynamics NAV database. This is compared to the 20-25 minutes that the now discontinued Developer’s Toolkit takes pre-process a NAV database. In addition Prism shows object dependencies with no hessitation. After an object is selected it is immediately clear what other objects refer to it and what objects it itself refers to. We call these two groups of links for “Used By” and “Using”. It is a kind of instant dependency map. Further, we now have a “Find Usages” feature. It is possible to, for example, find all usages of a field or procedure and Prism (as well as Supervision) already supports Dynamics NAV 2013. Certainly we have many more ideas but it’s been exciting to combine static program analysis and user experience into a combined developer productivity tool. There are still ideas left to explore here; in general the Dynamics NAV tools ecosystem feels a little under-nourished – although it is beginning to catch up since the 3-tiered architecture and the RTC client. In conclusion it has been fun and educational to explore program semantics and static program analysis. It certainly gives deeper insigts into the Dynamics NAV platform. So far our output has been two tools which believe can really help NAV programmers in their day-to-day work. This entry was posted in C/AL, Computer Science, Datamodel, Declarative, Imperative, Navision, Paradigm, Program, Software, Technical and tagged Bent Rasmussen, C/AL, Christian Clausen, Code Viewer, Dynamics NAV, F#, GUI, LinkedIN, Mibuso, Microsoft, Name Resolution, Navision, Prism, Productivity Tools, Semantic Analysis, stati-cal, Static Analysis, Static Program Analysis, statical, Supervision, tools, WPF. Bookmark the permalink.